Trust in Trump is in the dump. He promised to release his tax returns, and then did an about face. To top that, US intelligence now reports ongoing communication between Team Trump and Russian intelligence before the election, and the resignation of former NSA adviser Michael Flynn after the election has cast serious doubt on Trump’s loyalties. Americans need to know whether the President is serving our best interests, or his own. We need reassurance that he’s not in Putin’s pocket. The best path to understanding Trump’s financial ties and obligations are his tax returns, which he refuses to provide. Leaders of the House Intelligence Committee refuse to subpoena them, and with separate efforts by Reps. Bill Pascrell and Jerrod Nadler heading towards certain defeat on party lines, we need to push our Senators to take radical action by pushing the Senate Finance Committee to subpoena them. Let’s make sure Trump is acting on our behalves. Let’s call on Senators Wyden and Merkley to withhold unanimous consent on new Senate business until Senator Orrin Hatch, in his capacity as Chair of the Senate Finance Committee, agrees to subpoena Trump’s tax returns. Only then will Americans know whose side Trump is on – ours or his. “My name is [--] and I’m a constituent from [city], Oregon, zip code (---). I would like to THANK Senator Wyden for his willingness to use “every tool at [his] disposal” to shed light on Trump’s ties to Russia. I remain deeply concerned that without Trump’s tax returns, Americans can’t be sure Trump isn’t in the pocket of foreign governments, including Russia, and that he’s acting in our best interests and not his own. Can I count on Senator Wyden to withhold unanimous consent on any new Senate business until the Senate Finance Committee, led by Committee Chair Orrin Hatch, agrees to the subpoena? If Senator Wyden won’t do that, what will he do to ensure the release of Trump’s tax returns? “My name is [--] and I’m a constituent from [city], Oregon, zip code (---). I would like to THANK Senator Merkley for continuing to challenge Trump on many important issues. I remain deeply concerned that without Trump’s tax returns, American’s can’t be sure Trump isn’t in the pocket of foreign governments, including Russia, and that he’s acting in our best interests and not his own. Can I count on Senator Merkley to withhold unanimous consent on any new Senate business until the Senate Finance Committee, led by Committee Chair Orrin Hatch, agrees to the subpoena? If Senator Merkely won’t do that, what will he do to ensure the release of Trump’s tax returns? “No, we’re not going to do that,” Rep. Devin Nunes (R-Calif.) told reporters on Capitol Hill on Monday when asked if he planned to subpoena the documents. You and your like-minded friends from the Astoria area are invited to the kick-off meeting and postcard party for the Astoria/East County Community Group (CG)! Talk with others who share your concerns about healthcare, politics, public schools, free speech, and more. Help design the activities and actions you want this CG to take on. 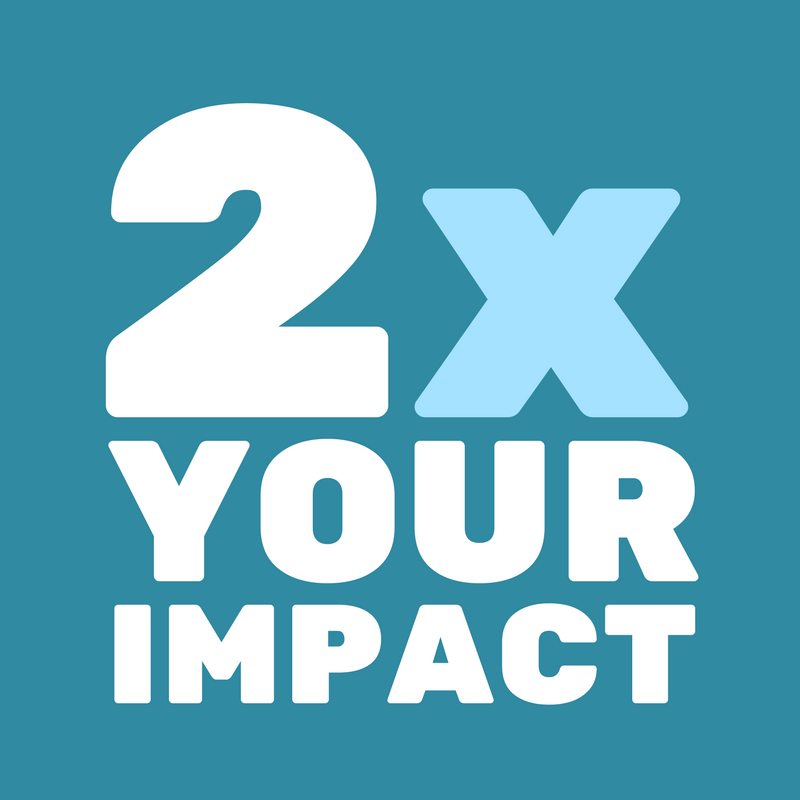 Be part of the vital political conversations and actions in Clatsop County! What do you REALLY want to say to 45 and his administration? Postcards, stamps, music, and refreshments at this drop-in event. Wednesday, March 8, 6-8 pm; Clatsop Community College, Columbia Hall 219, 16th & Lexington, Astoria; accessible parking in back. - Other INCO Community Groups are meeting regularly. If you’re not getting that info, send your zip code to incoregon@gmail.com, and we’ll sign you up for your CG. A high school student plans to start an INCO Community Group at Astoria High School. Are students at the college or at other area high schools interested in their own Indivisible Community Group? Please let us know, and we’ll help you get started! Contact incoregon@gmail.com. Make 5 calls in 5 minutes to your Member of Congress (MoC). This app provides phone numbers and scripts so calling is quick and easy. It uses your location to find your local representatives so your calls have more impact. 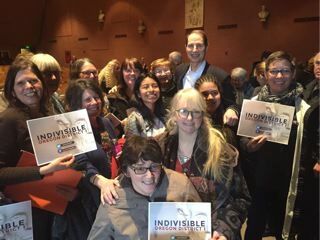 Senator Ron Wyden encouraged everyone at his Clatsop County Town Hall on February 24 to stay active and engaged with politics to defeat harmful, anti-democratic policies of 45’s administration. His call to action was echoed earlier as some two dozen people rallied with INCO on Marine Drive, determined to outlast the rain and 45. This was one of the best, most energized Town Halls we’ve seen in Clatsop County. Astoria Senior High School students and other audience members in the school’s auditorium asked focused, informed questions about pressing issues, including the involvement of Russia in the presidential election and policies and its apparent connection to Trump family finances; Medicare, climate change, student loan debt, and government transparency and accountability. Questioners were picked by a lottery of tickets given audience members as they arrived. Many in the audience waved their green “I Agree” and red “I Disagree” cards provided by Indivisible Oregon-District 1. What’s the best way for Americans to be heard by their Members of Congress (MoC)? Wyden said people should attend and speak up at public meetings, like Town Halls. Next most effective – and visible - are marches, then phone calls. He urged the audience to mobilize people they know in other states to contact their own MoCs, especially regarding close votes on important issues. He reminded us that political change is rarely top down, but begins from the bottom-up. He referred several times to doing things “the Oregon way” to emphasize inclusiveness and creativity in policy and policy-making. Pointing out that high school students probably don’t worry about Medicare, he said that Medicare’s costs are eating into other programs that students care about now, such as college loans and transportation. Wyden said one-fifth of jobs in Oregon depend on international trade. He and other MoCs will be the “watchdog” protecting the Environmental Protection Agency. He denounced “thinly veiled religious tests” and urged reform of our ”dysfunctional immigration system” because “we are a nation of immigrants . . . . this is fundamental to who we are.” Trump is the first president in forty years to not release his tax returns; “releasing tax returns is the lowest ethical bar” that allows voters to see real and possible conflicts of interest. If you’re new to political activism, you’re not alone: About half the audience hadn’t attended a Town Hall before. As you’ve probably seen and heard, more people than ever aregetting involved. 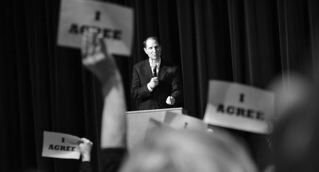 Eight hundred people attended Wyden’s recent Town Hall in Sisters, a town of 2000. Wyden encouraged the audience to stay vigilant and to find ways to make a difference in your community. Most of all, he urged us to stay in touch with him and your other Members of Congress. Thanks to Laura Rochelois for her photo of the rally. Last week was seriously spectacular. This was the first congressional recess of the year, and in town hall meetings across the country, you not only made a stand, you made a difference. In Florida, Republican Rep. Matt Gaetz agreed with a constituent that Donald Trump should release his tax returns. In Alabama, Republican Rep. Mo Brooks acknowledged that the pressure Members of Congress (MoCs) received at town halls could stop them from repealing Obamacare. And we like to think that constituent pressure had a little something to do with Rep. Darrell Issa’s call for an investigation into Trump’s ties with Russia. All over the country, your work is changing the national conversation. Investigate Michael Flynn's communications with Russia. Michael Flynn’s resignation as National Security Advisor doesn’t make this any less essential. Ask your MoCs to fully investigate how deep the Russian influence on Trump administration officials goes. Read the Indivisible's Reclaim Recess Toolkit to prepare. Expect 10-15 minutes of remarks about current issues, then Q & A Usually people are given numbered tickets as they enter; if your number is drawn you get to ask a question. Prepare by studying the Indivisible Guide on town halls. The Town Hall is probably 60 minutes, perhaps 90. It's a regular school day, per the online school district calendar. Parking lot will be fairly full; students might attend the Town Hall. 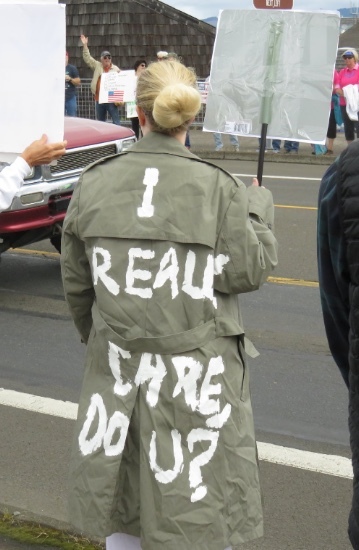 To stay informed, follow our Indivisible North Coast Oregon blog and Facebook group. And always, share this information with like-minded friends! ACTION: Sign your name to Declaration 17, newly launched as of this minute. "Declaration 17 is an open alliance of private individuals who have joined in opposition, challenge and resistance to the policies and practices of President Trump. Our goal is to rekindle public commitment to the founding documents that first articulated America’s core values. If you share our faith in the Constitution, the Declaration of Independence and the core American values we hold to be self-evident, please add your name and stand with us in opposition. In the coming weeks, we hope to hold local public readings around the country, to show our neighbors and the world how these founding documents differ from the policies and practices of President Trump and his administration. We want the people to have hope—not despair. We want the people to remember that throughout our history, when America’s values have been threatened from without or within, we have prevailed in upholding those core values—and we will prevail again. Please add your name. 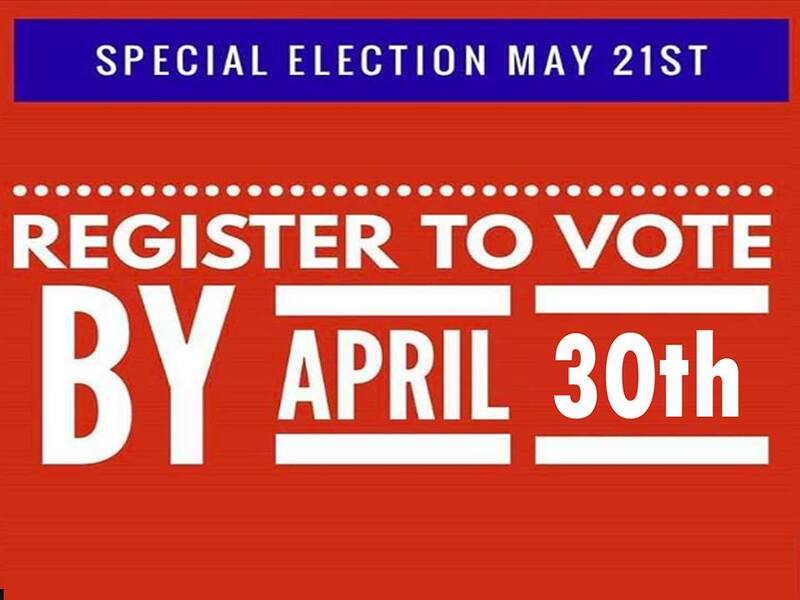 Become a signer, share the Declaration and watch for updates about new ways to get involved." The Pacific Green Party of Clatsop County will be meeting on Sunday, March 5th, at 4 pm at Clatsop Community College in room 101 of the Art Building. At this meeting, we will discuss the recruitment of candidates for the upcoming May 2017 Special Elections. We will also begin discussions on campaign strategies. We welcome all community members. 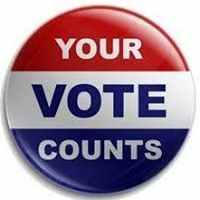 Volunteers who are willing to phone bank or participate in door-knocking may contact the chapter Chair, Jacqueline DeVaney, at jacquelinedevaney@gmail.com. Republicans in Congress are ramming through fast-tracked legislation that would block Oregon and other states from helping their citizens save money for retirement. Last week, the House passed H.J. 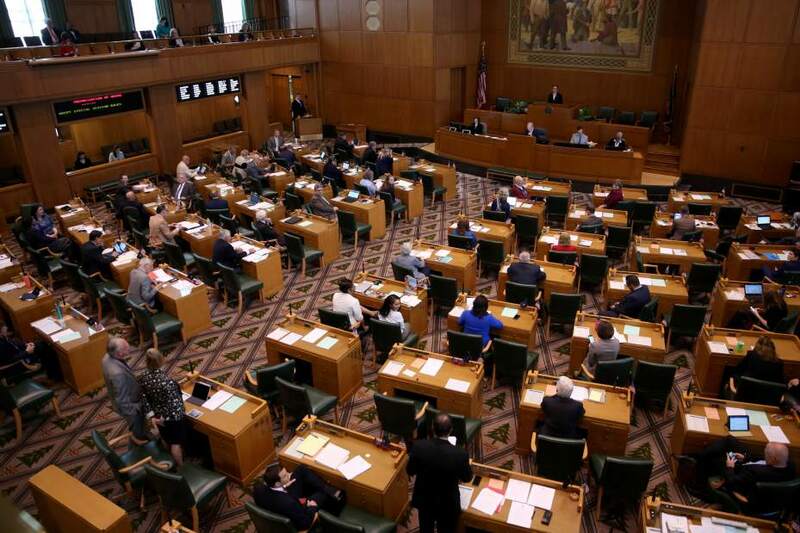 66, a bill that would nullify a Department of Labor ruling (and overturn an existing Oregon law) that expands access to personal retirement savings plans. If passed in the Senate, businesses would be forced to choose between offering a large, complicated pension plan -- or no plan at all. The DOL estimates 39 million Americans do not have access to retirement savings plans through their employees. Of those, only 10% contribute to outside savings plans. Without adequate retirement income, seniors are forced to scrimp on necessities in order to make ends meet. This also places more stress on state and federal social services. H.J. 66 strips away a state’s right to provide preventive solutions to poverty among seniors and eliminates choices for American workers. Urge our Senators to fight this harmful bill. "Turn your passive participation into active resistance. Facebook likes and Twitter retweets can’t create the change you want to see. Calling your Government on the phone can. --uses your location to find your local representatives so your calls have more impact"
It's available from the Apple App Store and from Google Play for desktop or Android. What kind of information would you like to see on the INCO blog? Answer the quick Google poll below and let us know. Why do we use Google polls? Indivisible North Coast Oregon (INCO) uses Google because it is an easy-to-use, free platform for getting feedback from our members. All responses are private, and we will never ask you for passwords or personally identifying information. Poll not displaying? Use this link: https://goo.gl/forms/durbTY5mJZWsZcm63. Getting a look at President TRUMP’S TAX RETURNS is the linchpin to getting answers to the questions swirling about his potential ties to Russia and to getting clarity about his potential conflicts of interest. There is tax law that gives the two congressional committees that set tax policy -- House Ways and Means Committee and Senate Finance Committee -- the power to examine tax returns. It was used in 1974 to view Nixon’s, and in 2014 in the investigation of the IRS’s handling of nonprofit status applications. The Chairman of either committee can acquire any individual’s tax return by requesting it from Treasury Department. After privately examining the returns the committee could then vote to share them with the full body, which would also make them public. All of the Democrats on the House Ways and Means (led by Pascrell of NJ and including our own Blumenauer) submitted a letter to Chairman Kevin Brady (TX) asking him to request Treasury to release Trump’s returns. Chairman Brady rejected it, saying “If Congress begins to use its powers to rummage around in the tax returns of the president, what prevents Congress from doing the same to average Americans?" Brady didn’t seem to have the same rummaging aversion when he voted three years ago with other Republicans on the committee to release confidential tax information of 51 taxpayers as part of an investigation into the way the Internal Revenue Service handled applications by corporations for non-profit status. Last week the committee Democrats tried to force the issue with a committee vote and were rejected on a strictly party-line basis. Ask Senator Wyden by email, phone or (best!) in person at an upcoming Town Hall -- What actions are happening regarding this in the Senate Finance Committee where you serve as Ranking Member? Tell him to demand that Chairman Hatch request Trump’s tax returns from the Treasury Department. If you have connections in Utah-- make sure they aware of this. Tell them to use every Indivisible tactic to demand Senator Hatch (Chairman of Senate Finance Committee) to make the request to Treasury. If you have connections in Texas District 8 (Huntsville area)-- make sure they are aware of this. Tell them to use every Indivisible tactic to demand that Congressman Kevin Brady take positive action on the letter from his committee members and make the request to Treasury. If you have energy left after all that give our neighboring district's Congressman Blumenauer a call and thank him for signing Pascrell’s letter, which you can read here. 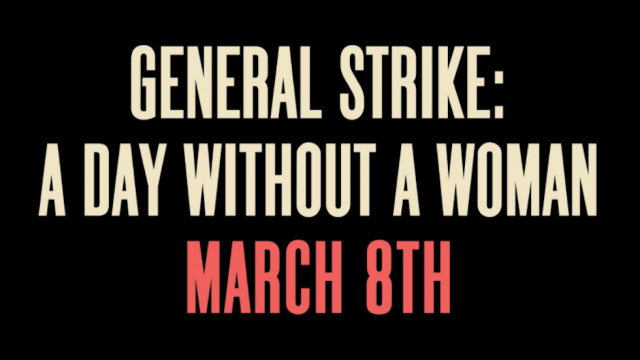 ASTORIA | Feb. 20 Protest and More! First off--THANK YOU for all of your patience to this point! We have been hard at work #Resisting and hope you have as well. The Astoria co-organizers met last night to continue our discussion of things to come, and we've got some good news! 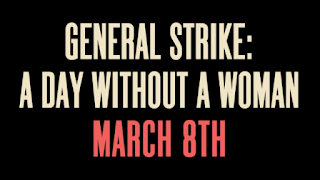 What better way to celebrate Presidents' Day than by standing up against the administration of our current one? A fair amount of people have the day off in observance of the holiday, so if you're one of those that do--or even if you just want to use your lunch break to speak out--please join us on the corner of Commercial and 8th Street in Downtown Astoria (the same corner as the U.S. post office). We're asking participants to bring signs, attitude, and enthusiasm to this important intersection to wave at passersby and engage with each other and the public about why we don't support what our current president is doing or his plans to hurt the futures of generations to come. WHEN: Monday, February 20th from Noon to 2 PM. WHERE: The corner of Commercial & 8th Street in Downtown Astoria (next to the post office). WHAT TO BRING: Signs of protest against the current administration, hope, or encouragement to keep going and to continue resisting. Be ready to be both loud and friendly. Encourage cars to honk in support and feel free to engage passersby with our message and what they can do to help. 1. BE SAFE: Do not block cross-walks, intersections, and leave sidewalks accessible to pedestrians. 2. BE POSITIVE: Be nice to each other, drivers, and pedestrians. Ignore hecklers. Do not engage! 3. MAKE FRIENDS: Please--talk to as many people as you can. Network, exchange ideas, and feel free to engage with Indivisible co-organizers about any ideas you have. Please attend the kick-off meeting for the Astoria chapter of Indivisible North Coast! Fort George has GENEROUSLY offered the use of the Lovell Showroom for our kick-off event. The agenda for this meeting is still being finalized, but will include further organization of our member base for various tasks and ACTION items. We will cover items addressed by the Indivisible Guide, such as interacting with members of congress (MoCs), writing campaigns, focused advocacy groups for specific issues, skill utilization, and the announcement of plans for upcoming meetings. We'd also like to give YOU an opportunity to interact with co-organizers and other freedom fighters about what you would like to see from the group in terms of action items and broader advocacy. Please come prepared to interact with others, offer ideas, and to let us know what skills you might be willing to use to help advance the cause (research, calling campaigns, letter campaigns, letters-to-the-editor, advertising, etc.). SPREAD THE WORD! We plan on notifying media outlets, as well as local and state leaders and lawmakers about this event. The more engagement we have from our members, the more effective and successful this event will be in mobilizing the city of Astoria to create a better future in the face of the greatest challenges of our time. A separate email will be going out within the next week to try to get a rough headcount for this event so that Fort George will know what to expect. Local organizer and advocate Pamela McDonald has booked space at Clastop Community College to use President Trump's favorite catchphrase against him--"You're fired!" Come and go as you please to this open house event to mingle with like-minded individuals and write a postcard to the Trump-in-Chief about his current job performance. Postcards and postage will be available,as well as the invaluable opportunity to meet other progressives and tell the president how you REALLY feel. This and more to come--but please, please mark your calendars and come to as many of these events as you comfortably can. To be successful in our efforts, we need to operate in solidarity. Coming out and being active in your community is the first step! Finally--please remember that you can reach out to the Astoria team at any time by emailing us directly at AstoriaIndivisible@gmail.com. If you’re planning to attend a Town Hall during the Congressional Recess next week (Feb. 19 – 26), be sure to check out Indivisible’s Reclaim Recess Toolkit, where you’ll find a helpful video guide and reports on how to hold a successful town hall, sample constituent questions, and actions plans for ACA, SCOTUS, and the Executive Order targeting Muslims and Refugees. Constituents should speak at town halls on topics that matter most to them. But our victories in changing the narrative against this “existential threat” point to the power of applying the same pressure at the same time. With that in mind, Indivisible suggest that at next week’s town halls, constituents make three defensive “asks”—ACA, Gorsich, and the Muslim/Refugee order—plus an offensive ask regarding the need for POTUS to release his tax returns. Indivisible recommends that local groups assemble in a prearranged location a bit before the town hall begins in order to review their strategy. (Watch for details from INCO about our pre-town hall gathering.) At this time, leaders will remind everyone to sit in pairs or very small groups, to maintain a posture of respect that reflects our values, and to frame questions in ways that press for information and action. It’s good for individuals to offer their stories and concerns to the press at the end of the town hall, but there should be one designated press person to speak on behalf of Indivisible, should those questions arise. (Press inquiries about INCO should be directed to Laurie Caplan or Deb Vanasse). Reportedly, over 200 MoCs are avoiding town halls next week because they don’t want to face their constituents. (Estimated only 50% are holding town halls, while 100 % are holding fundraisers next week). In response to this, local groups should organize their own town halls, invite their MoC and tell the press they’ve done so, and when the MoC doesn’t show up, have a cardboard cutout and/or empty chair to highlight that fact. Have backup speakers and let the story in the press be how the MoC wouldn’t face constituents. There’s a resource in the Recess Toolkit for taking such action. Some MoC staffers are refusing to share information with constituents about when and where town halls are scheduled. There’s a crowdsourced tool with this information—Town Hall Project. Tele-town halls are a joke. Don’t let reps get away with it. Greg Walden (OR-2) did this recently—4,000 on the call and he took 10 questions, most likely preselected to be favorable rather than confrontational. Stage a live town hall as described above. Even if you agree with your MoC on most issues, remember the power of both the carrot and the stick. Ask pointed questions such as “How many people in our district are covered by ACA insurance?” Don’t allow them to dismiss you as “paid” plants or any other such nonsense. Remember that they work for you. There are now over 7,000 local groups registered with Indivisible. Individuals are encouraged to email their personal stories on issues such as ACA to stories@indivisibleguide.com. Local groups are strongly encouraged to reach out to independents and Republicans who are alarmed by the Trump agenda. Defending democracy is not a partisan issue. Local groups are encouraged to continue to build out, with the goal of diversity. An attack on one is an attack on all. We’re making a difference. We’ll never have 100% success, but we’re in this for the long haul. 500 stamps and 750 postcards have been donated. We'll even have pens available. The emphasis is on writing and gathering together. Sponsor Pamela Matson McDonald is putting a revolving powerpoint together with helpful phrases and inspiring photos, which will be projected on one of the walls. KICKOFF MEETING TONIGHT IN ASTORIA!